I am a bit late posting tonight because we have been out in Maitland all day. I haven't had chance yet to check out any of the photos taken today so here is another photo of the pelicans taken at Little Beach a couple of days ago. I love pelicans eyes and their pink beaks. A fabulous close up, fav! A beautiful portrait,they are fabulous birds. He is very cute. I did enjoy your weather this weekend, it was so nice sitting in the sun yesterday before we came home. Having said that, the thunderstorm on Thursday afternoon was not fun. He’s so pretty, really. This side shot is wonderful. Wonderful capture, I do love pelicans! @nicolecampbell The thunder storm missed us mainly, we heard it off in the distance though and saw the lightning across the bay. Excellent close up! Great focus. oh that's a glorious portrait! Love it! Wonderful portrait. Great focus and details. Aren't they amazing birds? A very ungainly beak, I think he's resting it on his chin! Nice wave action too. A big effort watching downward with that beak in the way. Wonderful close-up of this fabulous bird. Excellent detail- you can almost count the feathers! Great shot and a fav. Cool. A great close up and fav. capture. Oh what a fabulous close up! 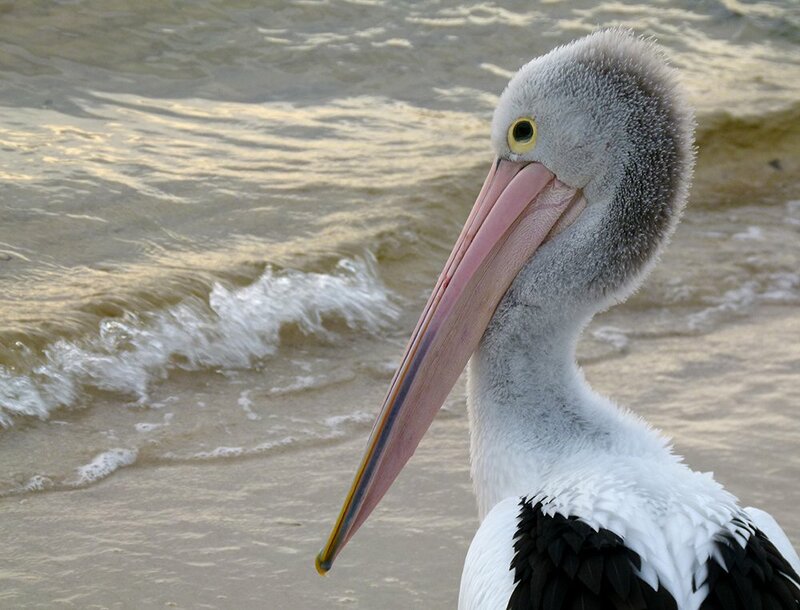 This pelican looks very proud to be on 365! Good catch. It is strange - I don't associate pelicans with sea water. Not sure why. Great close up image here - what amazing features they have. Fabulous closeup -- looking at him (or her?) looking out at the sea. Fantastic, just had to give this another fav. Beautifully detailed and titled! Fav. Congratulations! Loved this one on the TT page! Congratulations for your wonderful placing on the TT page. Great to see on TT!